The parse-cmd library consists of a single class, ParseCmd.java, that is "a Java-class used to define and parse command-line parameters in a Java application." The library is hosted on Google Code Archive and so could go away at any time. The JAR also appears to be available on GitHub. This post covers use of parse-cmd 0.0.93 to process command line arguments in Java. The parse-cmd Requirement Wiki lists several alternatives for processing command line arguments in Java, including some which have been covered previously in this series. After listing these alternatives, it states, "Reviewing these and other entries, it was time to try another parser." The document then goes on to delineate requirements that parse-cmd seeks to satisfy. The code listing demonstrates the definition of the expected command-line parameters using the ParseCmd.Builder() and the fluent methods available on instances of that class. Each method in turn returns an instance of the same Builder class so that these method calls can be chained together as shown above. As shown above, the usage/help string is built manually and provided to the Builder via the help(String) method rather than being built automatically by parse-cmd. The parm method of the ParseCmd.Builder class is overloaded, but in this code listing I used the method parm(String, String) that accepts the name of the parameter and a "default" value for that parameter. Had I only provided one string to the method accepting just one string, the default would have been assumed to be "1" for that parameter. In the case of the file path and name argument, this can lead parse-cmd to assuming the wrong type of parameter. By providing an empty String explicitly as a default, parse-cmd is able to accurately treat the argument for file path and name as a variable-length string. The --verbose argument is also defined in the above code and a default value is also provided to it because the implicit default of "1" would have turned verbosity "on" when no argument was provided and that's not been the default for verbosity in any of the earlier posts in this series of command-line parsing with Java. The invocation of req() on one of the chained returned instances of Builder indicates that the previously defined argument (--file) is required. The other argument (--verbose) does not have this specified and so is implicitly defaulted to optional. As far as I can tell, there's no easy approach with parse-cmd to specifying an alias or synonym for the defined command-line arguments. In other words, I don't see a way to tell parse-cmd that --file and -f are the same command-line argument. Therefore, I only use the "long" version with double hyphens in this example for both arguments --file and --verbose. With the previous Java-based command-line parsing libraries covered in this series, the "parsing" stage immediately follows the "definition" stage. While it's possible to make this same transition with parse-cmd, the advertised and preferred approach is to implement the "validation" stage after the "definition" stage and before the "parsing" stage. This stage allows one to see if any errors were found during validation of the available command line arguments and is demonstrated in the next (incomplete) code listing. The code listing just shown demonstrates use of the ParseCmd.validate(String) method used to validate that the command-line arguments match those expected as defined in the "definition" stage. If there are any unexpected results, a non-empty String is returned. An empty String is considered a good thing and indicates "valid" command-line arguments. With valid arguments, one can next move to "parsing" those command-line arguments as demonstrated in the next single-line code listing. The result of the invocation of ParseCmd.parse(String) is a Java Map<String, String> of argument name to argument value. The "interrogation" stage with parse-cmd is implemented by simply accessing the Map<String, String> returned by the parsing stage. One can query the map's keys by the argument name and the returned value is the value associated with that argument name. Note that the implication is that all arguments, even "boolean" arguments like --verbose, have a value associated with them rather than the presence or absence of the flag being the only required thing. In other words, --verbose must be followed by a value when expressed on the command line. The interrogation in this case of the two expected arguments is demonstrated in the next code listing. The full code listing for the example whose snippets have been shown in this post is available on GitHub. The next screen snapshot demonstrates a message printed when a required command-line argument (--file) is not provided. The screen snapshot that follows demonstrates successful application of the parse-cmd based command line processing of the --file and --verbose command line arguments. Here are some additional characteristics of parse-cmd to consider when selecting a framework or library to help with command-line parsing in Java. parse-cmd is open source with an Apache License 2.0.
parse-cmd is hosted on The Google Code Archive, which could be "turned down" at any time (currently states, "which will be turned down in early 2016"). The parsecmd-0.0.93.jar JAR file is approximately 50 KB in size. parse-cmd employs a fluent Builder implementation instead of using annotations. parse-cmd is another library (currently) available for Java developers who need to process command line arguments. It uses some assumptions and implications to make some of its decisions. The author of parse-cmd has written that parse-cmd was written despite "several Java-based command-line parsing solutions [being] available" because "they are generally complex to learn and use." The arguments "definition" stage of command-line processing with Argparse4j can be accomplished via the ArgumentParser interface and its addArgument(String...) method. The return type of the addArgument(String...) method is an instance of the Argument interface. Implementations of that interface (usually ArgumentImpl) provide methods for setting the characteristics of each argument. Because each of these methods returns an instance of Argument, these calls can be chained together in a highly fluent manner. This is demonstrated in the next screen snapshot. This is the seventh post in my series that briefly introduces various libraries for processing command-line arguments in Java. This post returns to coverage of an annotation-based library that seems to be one of the better known and more popular of the numerous available libraries for processing command line arguments from Java: JCommander. JCommander's web page states, "Because life is too short to parse command line parameters" and the Overview introduces JCommander as "a very small Java framework that makes it trivial to parse command line parameters." The code examples and associated screen snapshots of the executing code in this post are based on JCommander 1.72 (June 2017). The full code for the demonstrations shown here is available on GitHub. JCommander uses annotations to implement the "definition" stage of command-line processing. This is demonstrated in the next code listing snippet. * Demonstrates use of JCommander for Java-based command-line processing. The just-shown code listing demonstrates use of JCommander's @Parameter annotation to define the command-line options via annotation of class fields. The examples demonstrate specification of names to indicate multiple option flags to be associated with a single option, description to provide a description of each option, required=true to enforce presence of a command-line argument, and help=true to indicate a "help" or "usage" command-line argument (instructs JCommander to not throw exception if required arguments are not also provided). With the class attributes annotated with @Parameter annotations, an instance of the class with annotated fields can be used to create an instance of the JCommander class. In the code example above, I took advantage of the JCommander.Builder for the greater fluency and other advantages associated with use of builders. In particular, the instance with annotated class fields is added via the addObject(Object) method. The "parsing" stage of command-line processing with JCommander is accomplished via a single line invocation of the parse(String...) method on the instance of JCommander that was just instantiated. This is demonstrated in the next code listing. The "interrogation" stage of command-line processing with JCommander involves simply accessing the annotated fields of the instance passed to the JCommander class instantiation. This is demonstrated in the next code listing. The last code listing demonstrates the ability to determine if the boolean attribute with name help was set by the specification of --help or -h. Because it's a simple boolean, it can be used in the conditional and, if true, the help/usage information is presented. In the case when the "help" flag was not set, values associated with the other command line options ("verbose"/-v/--verbose and "file"/-f/--file) are accessed. The most recent code listing also demonstrates writing the usage information to standard output via an invocation of the method usage() on the instance of the JCommander class. It's worth noting that ParameterException also has a usage() method. The next series of screen snapshots demonstrate using JCommander with a simple application that includes the above code snippets. The first image shows running the JCommander-based application without any arguments and shows the ParameterException that is displayed in that case because the required --file/-f option was not specified. The next screen snapshot demonstrates "normal" execution when the expected command line arguments are provided. The next screen snapshot demonstrates use of the "help" option. Because this was annotated with help=true, the absence of the required "file" command-line argument does not lead to an exception and the automatically generated help/usage information is written to standard output. JCommander provides a feature that I really like for developing with and learning JCommander. 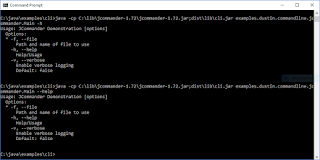 One can specify increased verbosity of the JCommander parsing by invoking the method verbose(int) on JCommandBuilder. With the increased verbosity, greater insight into what JCommander is doing related to command-line processing can be discovered and this is demonstrated in the following two screen snapshots. 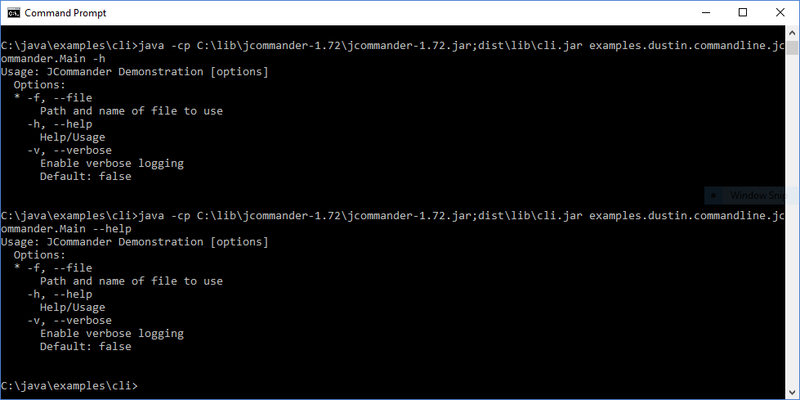 Here are some additional characteristics of JCommander to consider when selecting a framework or library to help with command-line parsing in Java. JCommander is open source and licensed with the Apache License 2.0. The jcommander-1.72.jar is approximately 68 KB in size and has no third-party library compile dependencies. The JCommander documentation provides examples of using JCommander with Kotlin and using JCommander with Groovy. JCommander is still actively supported by TestNG creator Cedric Beust and its web page reflects its modern/current support. The main web page for JOpt Simple calls this Java-based library "a Java library for parsing command line options, such as those you might pass to an invocation of javac," that "attempts to honor the command line option syntaxes of POSIX getopt() and GNU getopt_long()." This is the sixth post of my series of command-line arguments processing in Java and its focus is on JOpt Simple. Most of the libraries I've reviewed in this series of command-line processing in Java take use annotations in some way. JOpt Simple, like Apache Commons CLI, does not use annotations. JOpt Simple supports "fluent interfaces" instead. This original post's examples (code listings) and output (screen snapshots) are based on compiling and running against JOpt Simple 4.9, but they have worked similarly for me (and without code changes) when compiling them and running them with JOpt Simple 5.0.3. The next code listing demonstrates the "definition" stage of command-line processing with JOpt Simple and this example is intentionally similar to that used in the previous posts on command-line processing in Java. This code listing demonstrates use of the "fluent API" approach to defining command-line options. An OptionParser is instantiated and then one of its overloaded acceptsAll methods is called for each potential command-line option. The use of acceptsAll allows multiple flag/option names to be associated with a single option. This support for option synonyms allows for use of "-f" and "--file" for the same option. The code above demonstrates that a command-line option can be specified as required with the .required() method invocation. In this case, a "file" is required. If an argument is expected to be placed on the command line in association with the option/flag, the withRequiredArg() method can be used. The "help" option in the above code listing takes advantage of the forHelp() method to tell JOpt Simple to not throw an exception if a required option is not on the command-line if the option associated with the forHelp() is on the command-line. This works, in my example, to ensure that the operator could run the application with -h or --help and without any other required option and avoid an exception being thrown. The JOpt Simple Examples of Usage page provides significant details about the many different possibilities available when defining command-line options and uses JUnit-based assertions to demonstrate how these different tactics for defining command-line options configure differently what is parsed. My code listing shown above only shows a minor subset of what's available. Note that the Javadoc comments for the OptionParser class also contain significant details. The code above can be even more concise if one statically imports the Arrays.asList and passes the potential command-line options' names as strings directly to that asList(String...) method instead of using the approach I used of creating an array of Strings first and then converting them to a list. I used this approach in this introductory post to make it very clear what was happening, but it's likely that the version of the code associated with this post on GitHub will be changed to use the static import approach. The "interrogation" stage of command-line processing with JOpt Simple is also simple and is demonstrated in the next code listing. The single line of code demonstrates that interrogation consists of calling convenient methods on the instance of OptionSet returned by the parsing call. In this case, two demonstrated methods called on OptionSet are OptionSet.valueOf(String) and OptionSet.has(String). JOpt Simple also supports automatic generation of a usage/help statement. The next code listing demonstrates doing this. The single line of code just shown writes the usage/help information generated by the instance of OptionParser to the output stream provided to it via its printHelpOn(OutputStream) method. With the most significant code needed for applying JOpt Simple shown, it's time to see how the simple application that uses this code behaves. The following screen snapshots demonstrate the code in action. The first screen snapshot demonstrates the MissingRequiredOptionsException printed when the required "file" command-line option is not provided. The next screen snapshot demonstrates specifying the "file" and "verbose" options on the command lines. The automatic usage/help message provided by JOpt Simple is demonstrated in the next screen snapshot. Here are some additional characteristics of Apache Commons CLI to consider when selecting a framework or library to help with command-line parsing in Java. JOpt Simple is open source and is licensed under the MIT License. As of this writing, the latest versions of JOpt Simple are 5.0.3 and 6.0 Alpha 1; JOpt Simple 4.9 (latest version currently listed in the JOpt Simple change log and version currently shown in Maven dependency example) was used in this post. The jopt-simple-4.9.jar is approximately 65 KB in size and has no compile-time dependencies on any third-party libraries. JOpt Simple has been or is used by several influential libraries and frameworks. These include Spring Framework (optional compile dependency) and JMH (compile dependency). The main page for the JOpt Simple web page quotes Mark Reinhold, "I thought you might be interested to know that we're using your jopt-simple library in the open-source Java Development Kit. Thanks for writing such a nice little library! It's far cleaner than any of the other alternatives out there." JOpt Simple has been available for several years, but appears to still be maintained (latest on Maven Central is December 2016). JOpt Simple does not use annotations and instead relies on fluent API calls. JOpt Simple supports relationships between command-line options such as required dependent options. It is typically a positive sign of a library's usefulness when other well-received and useful tools and libraries make use of that library. JOpt Simple's selection as the command-line processing library of choice for some such tools and libraries definitely speaks well of JOpt Simple. JOpt Simple provides a useful and powerful alternative to Apache Commons CLI for those who prefer Java command-line processing that does not use annotations. JOpt Simple provides significant more capability than that shown in this post and this capability is best discovered by reading the unit test-based "tour through JOpt Simple's features."